WJCT Radio Reading Service enriches and empowers the lives of individuals in Northeast Florida and Southeast Georgia who are visually impaired and print challenged. Our closed circuit radio station broadcasts commercial-free readings of local and national newspapers, magazines, books, and much more 24 hours a day, 7 days a week. Founded on May 3, 1993, it remains the only service of its kind on the First Coast. If old readings play when one of the buttons below is clicked, try clearing your web browser’s cache in order to make sure you have access to the most recent reading. Our thanks to this year’s contributors to the WJCT Radio Reading Service: Florida Eye Specialists, Tidbits, Delta Gamma of UNF and the Mackowski Family Foundation. Welcome to the Radio Reading Service for people living with low vision. Whether you are listening to the Radio Reading Service (RRS) here online, or are listening via a free special radio receiver we have loaned you, we hope that you are enjoying the range of programs offered 24 hours, 7 days a week. Because our funding comes from grants and donations, we are sometimes asked to provide information about our listening audience, and demonstrate our commitment to obtaining Listener feedback. To keep our Listener database up-to-date and to improve our programming, please tell us if you’re an online listener by filling out the Listener Application/Data Form below. You do not need to fill out the Listener Data Form online if you have already completed and sent in a hard copy version previously. If you want to return your radio receiver, please print and fill out the Radio Receiver Return Form and follow the instructions. Thank you for being a part of our listening audience. Feel free at any time to give us call at (904) 358-6308 with any questions or feedback you may have throughout the year. New Radio Reading Service schedule starting November 19, 2018. WJCT Radio Reading Service provides news, information, and entertainment through a wide variety of publications, including the Florida Times-Union, USA Today, Wall Street Journal, Washington Post, popular magazines, and best selling books. Other highlights include the latest from the Blindness & Disability News Hour, tales of travel, health, exercise, consumer tips, and more! Our locally produced and hosted program is Williemae’s Inspirational Music (Sundays at 6:30 am/pm & 12:30 am/pm). Over 30 local volunteers, as well as program providers and volunteer readers throughout the country, help WJCT Radio Reading Service achieve excellence in programming. Volunteers provide the heart and voice of the WJCT Radio Reading Service. 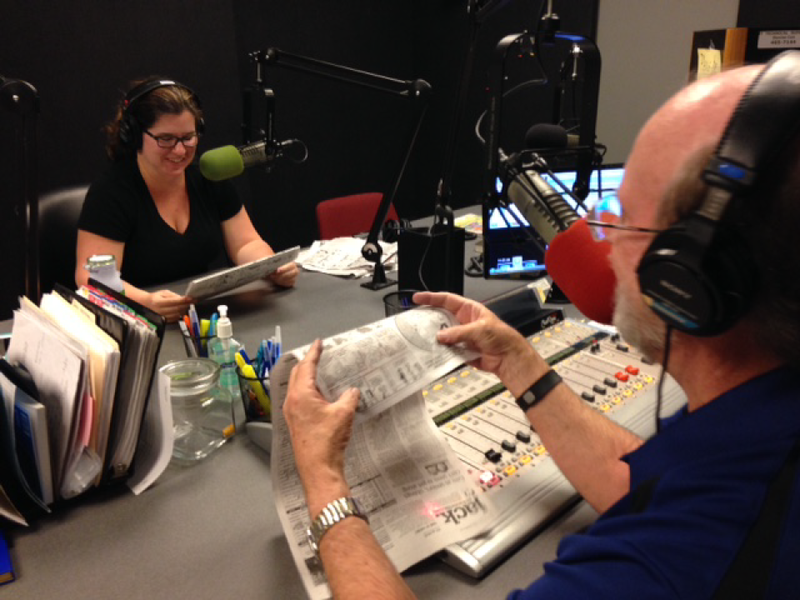 Local volunteers broadcast live readings of the Florida Times-Union and other printed material seven days a week. Each volunteer reads up to two hours per week with one or two partners. Our volunteers represent all walks of life. They are teachers, librarians, financial executives, former broadcasters, entrepreneurs, homemakers, photographers, actors, attorneys, students, and retired professionals. Listed below are qualifications that enable them, and hopefully YOU, to maintain the high quality of service our listeners deserve. Rachel Schwertfeger (left) and Bill Robichaud (right) are volunteer RRS readers on Saturdays. 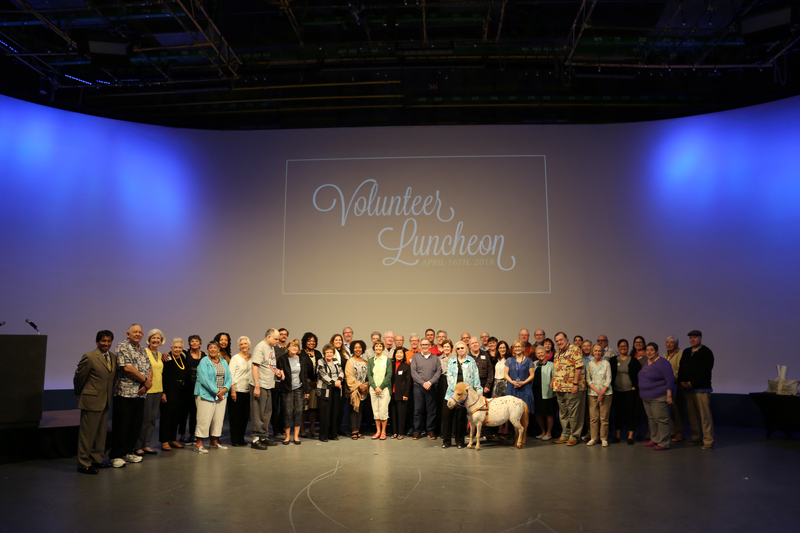 On April 16, 2018, WJCT hosted a luncheon celebrating and honoring each and every one of WJCT’s many volunteers, including those of the Radio Reading Service. The luncheon also celebrated the 25th Anniversary of RRS, which was founded in 1993. Jane Hart has been a volunteer reader that entire time! 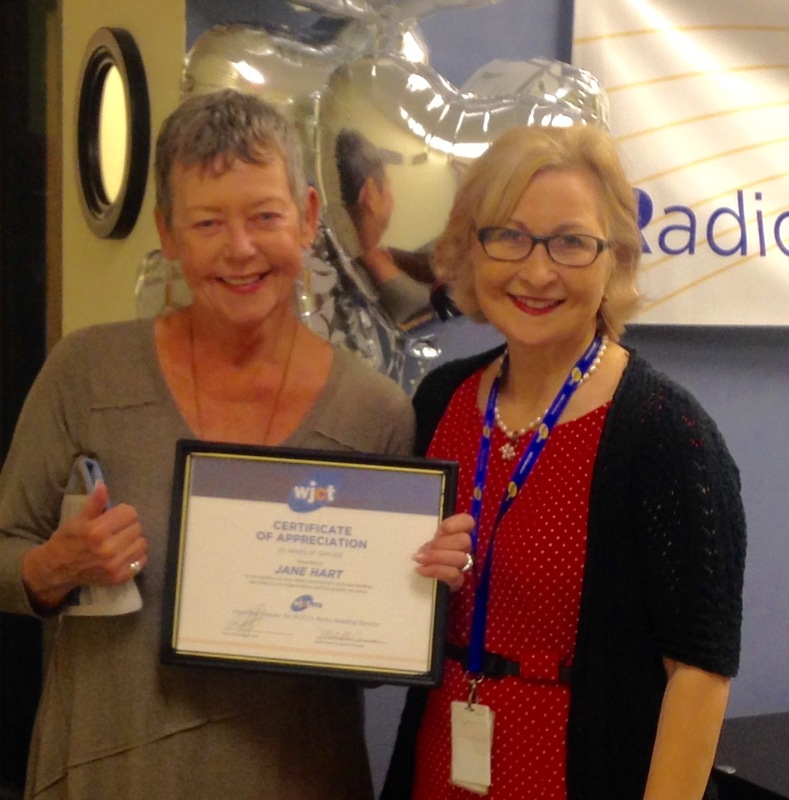 Volunteers like Jane go above and beyond to help WJCT serve the First Coast community. Thank you, volunteers! View images from the 2018 volunteer luncheon! 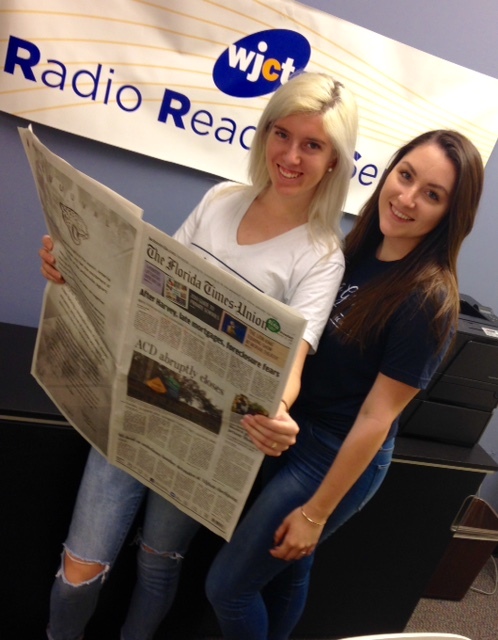 In 2017, Delta Gamma sorority at UNF donated nearly $3,000.00 to WJCT’s Radio Reading Service for the blind and visually impaired. The funds will help pay for the special sub-channel radios that listeners need in order to hear the service. In addition to this contribution, Delta Gamma sorority members, as part of their philanthropy, help read the Sunday newspaper (the Florida Times-Union) to the approximately 900 listeners who need it. WJCT Radio Reading Service is a non-profit service depending solely on donations to operate. Contributions are vital to the continued success and growth of this service. A donation is appreciated. If you enjoy our service, please encourage friends and family to offer financial support. 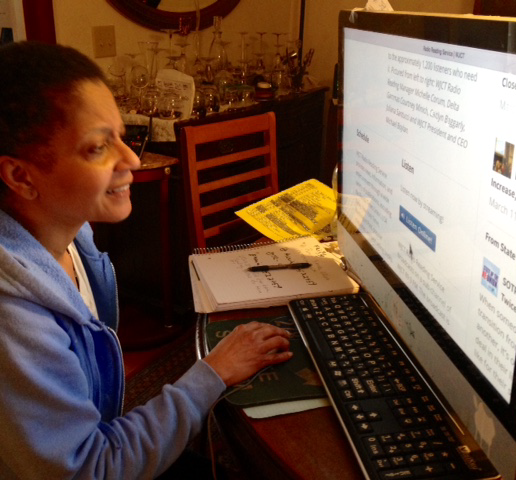 This tax-deductible gift will provide news, information, entertainment, and cultural opportunities to community members who are visually impaired and print-challenged. You will connect and engage listeners as you give the gift of independence.